About half of developing countries express ambition to use agroforestry—the integration of trees with crops, livestock and other non-forest timber products—for adaptation and mitigation of climate change. In order for agroforestry contributions to be recognized and rewarded, however, countries need reliable systems for measurement, reporting and verification (MRV). Here we review, through key informant interviews and examination of official documents, how agroforestry is addressed in national MRV under the United Nations Framework Convention on Climate Change (UNFCCC). Our review highlights significant gaps between national ambition and national action and capabilities. These gaps are smaller in some countries than in others, but not even one country systematically includes agroforestry in all of its relevant MRV systems. Barriers to the inclusion and explicit representation of agroforestry in MRV systems include: (1) technical barriers, such as exclusion of agroforestry from definitions of land use and lack of access to high-resolution satellite imagery; (2) institutional barriers, such as overlapping or contradictory institutional mandates and lack of human capacity to use available tools; and (3) financial barriers that prevent consistent measurement and inclusive processes. The fact that agroforestry often is not counted in UNFCCC MRV systems has serious implications: If agroforestry trees aren’t counted in MRV systems, then in many ways they don’t count. Only if agroforestry resources are measured, reported and verified will countries gain access to the financial and other support they need to effectively include agroforestry in climate change adaptation and mitigation. Based on emerging lessons, we recommend six ways to support countries to improve MRV of agroforestry. Rosenstock T, Wilkes A, Jallo C, Namoi N, Bulusu M, Suber M, Bernard F, Mboi D. 2018. 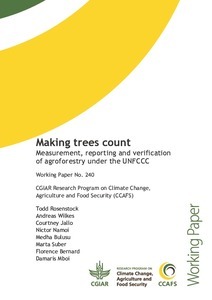 Making trees count: Measurement, reporting and verification of agroforestry under the UNFCCC. CCAFS Working Paper no. 240. Wageningen, the Netherlands: CGIAR Research Program on Climate Change, Agriculture and Food Security (CCAFS).